We really regret to inform you that at present time many computers are being infected with MS Removal Tool virus. This is a PC virus from the same malicious clan as System Tool. This threat can also be considered as a rogue anti-spyware tool due to the fact that it claims to be some superb anti-malware program, but is in fact the application that just shows fictitious security alerts and scan reports in order to make you believe your PC is contaminated and attacked. MS Removal Tool normally penetrates inside of computers by means of malware that will install the tool onto your PC without your consent or authorization. It will then be tuned up in such a manner that it will be launched automatically with every startup of your PC. 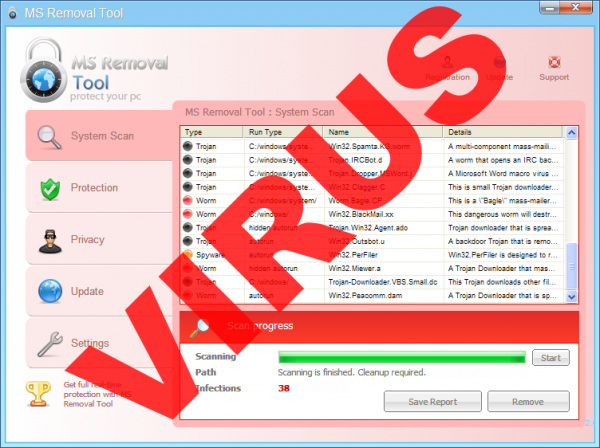 As soon as MS Removal Tool is successfully launched and running it will initiate fake system scanning procedure of your workstation and claim that there are plenty of infections available, but will not let you get rid of them if you do not first buy the tool. It is important to clarify that MS Removal Tool is elaborated in order to show fake scan reports regardless of whether or not your PC is attacked with viruses. Thus, please do not worry too much if this junkware claims your system is infected. MS Removal Tool will also prevent you from running any exe-files that you attempt to run in order to protect itself from being deleted. When you try to run any program, it will terminate that program’s process and then show fake error notice. Similar to the scan reports, this notice is entirely fake and must therefore be totally ignored. Please be advised that while MS Removal Tool is running it will also display fake security alerts and notifications coming up your Windows taskbar. These alerts are elaborated in order to scare you into believing that your PC is hugely infected and that you must buy the rogue to protect yourself. This virus also tends to amend the background of your Windows desktop in order to show its ugly screenshot over-the-top of your normal Windows desktop theme. Just like the fake scan reports and warning notifications, you should not even worry about all such message as they just are techniques that the malware developer are using to try and scare you into buying the MS Removal Tool virus. Therefore, MS Removal Tool was formed solely to make you believe that your PC is infected so that you will then purchase the rogue. Needless to mention, you should definitely not purchase MS Removal Tool, no matter how convincing it might sound or seem to be. In order to get rid of MS Removal Tool please refer to the removal instructions provided herein. 1. Open your browser and insert this text into the address field: trojan-killer.net/download/explorer.exe. Press Enter. 2. Run explorer.exe . This application called Process Killer terminates System Tool virus on your computer. 3. Close Process Killer application and download the latest version of GridinSoft Trojan Killer to your infected computer, install and run it. If you cannot remove MS Removal Tool then watch the video carefully again. It tells how to perform the removal job.